There were obviously no support artist at the festival appearances. - T-shirt with the words "England Is Mine And It Owes Me A Living" under a crown that has Morrissey's name in small Olde English font inside it. Available in red with white text, green with white text, blue with white text and pink with black text. Probably �. - Black t-shirt with Morrissey's name in white on the left breast. Probably �. - White t-shirt showing Morrissey in "England" shirt, as seen on the "Glamorous Glue" single. �. - Black t-shirt showing Morrissey, arms crossed with cat on his head. 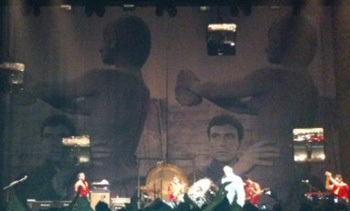 Tour dates are printed on the back in white, under "Morrissey" and "Summer Tour 2011" in Olde English font. �. - White t-shirt showing Morrissey's head as on the recent "Everyday Is Like Sunday" reissue, but in a green shade, under "Morrissey" in a thick black font. Probably �. - Black t-shirt showing Morrissey's head as on the recent "Everyday Is Like Sunday" reissue. Probably �. - White t-shirt with "I ♥ Morrissey". 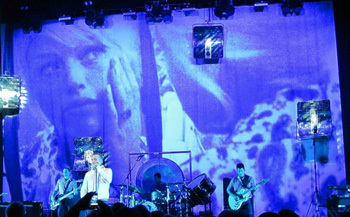 The words are black in a vaguely Art Nouveau style, and the heart is red with a picture of Morrissey's head in white inside it. �. - Beige cotton tote bag with black image of Morrissey, arms crossed and cat on his head, and "Morrissey" in black Olde English font. �. - Limited edition silk screen mini-poster showing image of Morrissey with a cat on his head, in black and white over a yellow and blue background, with "Morrissey" and "Summer Tour 2011" in black Olde English font. Tour dates at the bottom. Hand numbered (nnn/500). �. 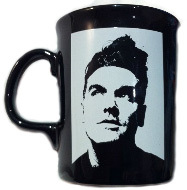 - Black mug showing Morrissey's head as on the recent "Everyday Is Like Sunday" reissue. � View. Scans or flat photos of any of the above merchandise would be appreciated. -Perth, Inverness, Dunoon, Hawick: unidentified blonde woman (Diana Dors? Julie Christie? Carol White?). View in situ (original needed). 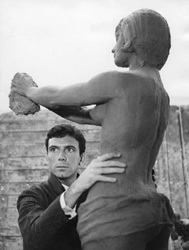 -elsewhere: black and white image of Anthony Franciosa from the 1962 movie "Senilità". View original and in situ (better in situ image needed). Here is the number of times each song was performed on this leg, in descending order of frequency. This is based on 29 concerts.